Advertising through the Ages — Marketing Analytics | Online Guide for Marketing Professionals. “To communicate is to be human.” Word of mouth, the original mode of communication, remains the most persuasive form of advertising; its impact greatly amplified by social media. One of the earliest formal writing systems dates back to Egypt, 3300 BC. At that time ancient Egyptian writing used hieroglyphic characters that combined logographic and alphabetic elements. In 2000 BC, the Egyptians started carving public notices in steel, a form of outdoor advertising. Johannes Gutenberg, a German goldsmith and printer, invented the printing press in 1439 AD. His major work, the 42-line Gutenberg Bible, marked the start of the printing era. The first print advertisement in England was said to have been placed on a church door in 1472. Newspaper ads appeared in 1650. Fundamental to the success of a business is the need to make customers aware of products and services. It follows that growth in advertising is linked inextricably with developments in industry. Of particular significance is the industrial revolution (1750–1850) which led to explosive growth in the production and supply of goods, and in the advertisement of those goods, in England and Europe. The first radio broadcasts were aired in the early 1900s. Years later, in 1919, radio stations began to broadcast continuously. On 2 November 1920, a U.S. radio station (KDKA) aired the first commercial broadcast. A number of scientists working on many different technologies spearheaded the invention of the television. The Scottish inventor John Logie Baird gave what is regarded as the first public demonstration of televised silhouette images in motion, at Selfridges Department Store in London, on March 25, 1925. His company (Baird Television Development Company/Cinema Television) also made the first commercial TV sets in the UK in 1928. TV ad revenues surpassed radio and magazine ad sales in 1954. The World Wide Web was invented in 1969 with the creation of the Advanced Research Projects Agency (ARPA) Network (ARPANET) by ARPA of the Department of Defense (DOD). ARPANET linked time-sharing computers at four research sites by telephone lines. It took another 25 years for the internet to gain general public awareness. Banner ads first appeared in 1994. Pay-per-click advertising also debuted in 1994. Mobile advertising commenced in 1997. Google launched AdWords (now Google Ads) in 2000. Video ads appeared on YouTube in 2006. Online advertising overtook print and radio in 2011. In 2013, for the first time there was a drop in the number of pay-TV subscriptions in the U.S. Mobile advertising revenues overtake desktop by end of 2016. According to PWC’s Global entertainment and media outlook 2016-2020 for the U.S., online advertising will overtake broadcast advertising in the U.S. in 2017, and mobile’s share ot total ad spend in the U.S. will rise to 49.4% in 2020. Exhibit 15.2 Coca-Cola advertising over the years (1907, 1940, 1970, 1993, and 2013). The above developments have had a profound impact on communication, and shaped the manner and the means we use for advertising. The Coca-Cola print advertisements depicted in Exhibit 15.2 reflect the transition over the past 100 years. Some changes relate to technology — sharper images and more vibrant colours. Text was much more prevalent in the past, advertisements used to be more informative, nowadays they more associative. 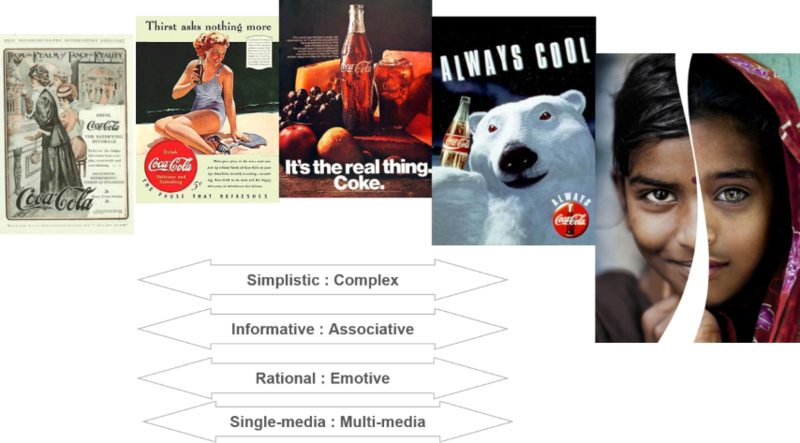 Content used to be rational, now we experience a wide spectrum of emotions. Messages were largely simplistic, now they tend to be more complex. And over time advertising campaigns are increasingly spread over a number of conventional and new media channels. Consider, for instance, Coca-Cola’s “Small World” multimedia campaign of 2013. The advertisement shown in Exhibit 15.2 draws one’s attention to the symbols — a bindi on the forehead, the mark of Hinduism, the dupatta covering the head, which is commonly worn by women in Pakistan and India, and the Coca-Cola mnemonic between the two faces. The message “That what unites us is stronger than what divides us” is highlighted in the online campaign and a sense of “togetherness” is imparted through the “Small World (vending) Machines” that Coca-Cola installed at New Delhi and Lahore. The campaign as a whole associates the Coca-Cola brand with values and feelings that people cherish — togetherness, happiness, harmony and peace. Some of these thoughts and feelings were initially conveyed in previous ads of Coca-Cola. In particular, one is reminded of lines from a 1970s Coca-Cola commercial — “I'd like to teach the world to sing in perfect harmony, I'd like to buy the world a Coke and keep it company”. The expansion of the number of media options and media channels has fragmented audiences. What used to be a mass audience is now dispersed across multiple screens and platforms. While there were barely two or three TV channels in most countries in the 1970s, there are scores if not hundreds of options on cable and TV today. Digital radio and podcasts have split the audience for audio. The internet has further diluted audience concentration. As a result, it is much harder for marketers to reach target consumers. At an IRI (Information Resources Inc.) summit in 2006, Jesper Wiegandt, then Marketing Director at Procter & Gamble said of the U.S.: “To reach 80% of the population in 1977, you would have needed just three television advertising spots. To reach the same figure today, around 75 spots are required”. It does not help that over time, the cost of TV advertising has grown faster than inflation. Advertising clutter too has grown as a result of an overcrowded marketplace, as also the trend from 30–60 second spots to 10–15 seconds. Further with the help of technology, viewers are able to skip ads by zapping, grazing and channel surfing. As a result, efficiency and effectiveness has declined sharply, and there is growing disenchantment with mainstream media. Marketers are facing the challenges of lower returns on their advertising spends, greater complexity in reaching their target consumers, and the need to coordinate and integrate their communication programme across multiple media platforms. And as they spread their budgets across media, the share of conventional media is in decline.